1. The Board, vide Circular No. 1/1/2017-GST dated 26th June, 2017, assigned proper officers for provisions relating to registration and composition levy under the Central Goods and Services Tax Act, 2017 (hereinafter referred to as the “CGST Act”) and the rules made thereunder. Further, vide Circular No. 3/3/2017 - GST dated 5th July, 2017, the proper officers for provisions other than registration and composition under the CGST Act were assigned. 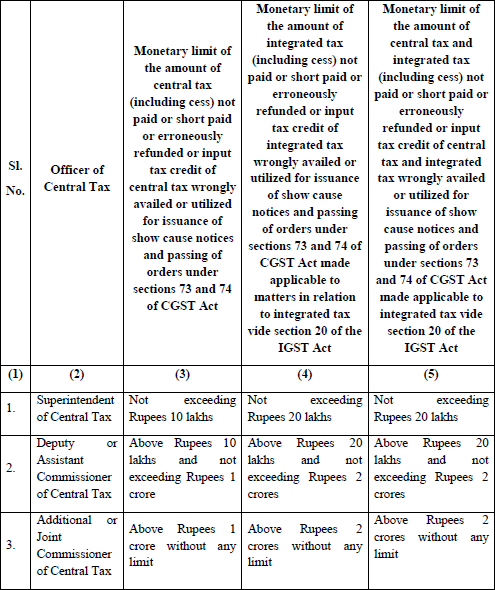 In the latter Circular, the Deputy or Assistant Commissioner of Central Tax was assigned as the proper officer under sub-sections (1), (2), (3), (5), (6), (7), (9) and (10) of section 74 while the Superintendent of Central Tax was assigned as the proper officer under sub-sections (1), (2), (3), (5), (6), (7), (9) and (10) of section 73 of the CGST Act. 4. In other words, all officers up to the rank of Additional/Joint Commissioner of Central Tax are assigned as the proper officer for issuance of show cause notices and orders under subsections (1), (2), (3), (5), (6), (7), (9) and (10) of sections 73 and 74 of the CGST Act. Further, they are so assigned under the Integrated Goods and Services Tax Act, 2017 (hereinafter referred to as the “IGST Act”) as well, as per section 3 read with section 20 of the said Act. 6. The central tax officers of Audit Commissionerates and Directorate General of Goods and Services Tax Intelligence (hereinafter referred to as “DGGSTI”) shall exercise the powers only to issue show cause notices. A show cause notice issued by them shall be adjudicated by the competent central tax officer of the Executive Commissionerate in whose jurisdiction the noticee is registered. In case there are more than one noticees mentioned in the show cause notice having their principal places of business falling in multiple Commissionerates, the show cause notice shall be adjudicated by the competent central tax officer in whose jurisdiction, the principal place of business of the noticee from whom the highest demand of central tax and/or integrated tax (including cess) has been made falls. 7. Notwithstanding anything contained in para 6 above, a show cause notice issued by DGGSTI in which the principal places of business of the noticees fall in multiple Commissionerates and where the central tax and/or integrated tax (including cess) involved is more than Rs. 5 crores shall be adjudicated by an officer of the rank of Additional Director/Additional Commissioner (as assigned by the Board), who shall not be on the strength of DGGSTI and working there at the time of adjudication. Cases of similar nature may also be assigned to such an officer. 8. In case show cause notices have been issued on similar issues to a noticee(s) and made answerable to different levels of adjudicating authorities within a Commissionerate, such show cause notices should be adjudicated by the adjudicating authority competent to decide the case involving the highest amount of central tax and/or integrated tax (including cess).